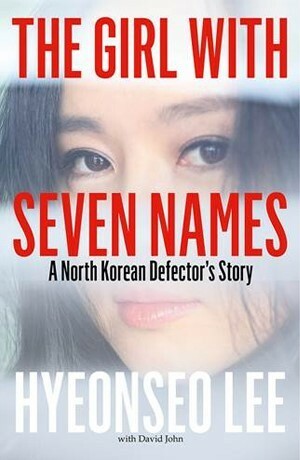 The Girl With Seven Names by Hyeonseo Lee. William Collins, 2015. Hardcover. 320 pages. The Girl With Seven Names left me feeling completely speechless, and I've had to wait a few days before I could even sit down and begin to somehow nudge out a review of my incoherent thoughts . This was one of those rare books that was compulsive, heart-wrenching, and impossible to put down. Lee tells her story in an intensely compelling manner that is largely due to, in my opinion, her complete and utter lucidity at what occurred throughout her entire life. She does not pretend that she had a horrible life as a child, she does not hide the horrible aspects of her experiences, and she also does not hide any action she took that she deems unforgivable. In fact, there are many times throughout the book where Lee discusses how she felt as if she were an awful person and how she eventually began to dislike and even hate herself. By doing this, Lee brings awareness to the immense emotional toll the entire process can inflict on a person. The Girl With Seven Names reads like fiction, which makes it highly readable and engaging. I also believe that Lee's story is exceptionally unique compared to many of the other stories that exist surrounding North Korean defectors and their lives, mainly because Lee lived a relatively safe and comfortable life in a higher class North Korean community. What I actually found most interesting was that her decision to leave and escape from North Korea was not actually her initial choice - she left to visit China with every intention of returning to North Korea, but was eventually unable to return at all. Lee is blunt about all of her decisions and thoughts, which makes her appear to be honest and sincere. I also appreciated the in-depth discussion and experiences of what life is like for those that successfully defect from North Korea and now live in places such as South Korea. As many people probably don't realize, life is not smooth sailing once they are free. Indeed, it is difficult for a North Korean - especially one who is an adult or elderly - to adapt to a world that is completely foreign to them. They did not have the same schooling or likely learn any of the same skills of those that South Koreans have and thus struggle to survive. Those who experienced higher standings in North Korea now have to work lower-class jobs, and those who had hoped for a more comfortable life still struggle with finding work and fitting in with their new country, all the while dealing with stereotypes and negative perceptions of North Koreans that many other countries held. Lee writes with sincerity and passion. I savored the fact that she shared so many of her conflicting opinions regarding her home country. While she realized how oppressive and horrible it is, it was still her home; it was where she grew and spent her childhood, and although most people in North Korea had difficult or frightening upbringings, Lee's was not filled with terrors, and she understands it. She grew up strongly under the communist spell, and slowly became disillusioned as she began to witness public executions and discover the darker side of the country. Overall, I can't help but give The Girl With Seven Names five stars because of its readable quality, captivating topic, and raw, sincere writing. I highly recommend this to anyone interested in foreign cultures, autobiographies/biographies, thriller fans, or honestly anyone who wants a good book to read. You won't be disappointed! Get more reviews and book news in your inbox and subscribe to Forever Lost in Literature!